Yesterday morning nearly 40 people addressed the California Public Utilities Commission, demanding an immediate halt to the ‘smart’ meter rollout and telling of widespread health impacts from the new wireless meters. Here is what our Director, Joshua Hart, told the commission yesterday, before he was hauled away by CHP officers for exceeding the one minute time limit. “My name is Joshua Hart with Stopsmartmeters.org. I have a list that grows by more than a dozen people every week- people who are suffering health damage from ‘smart’ meters. What do I tell these people- these engineers, nurses, teachers suffering insomnia, tinnitus, headaches, and heart arrhythmias? What do I tell them when they ask how they can get this device removed from their house? Sorry the CPUC and PG&E think you are crazy? 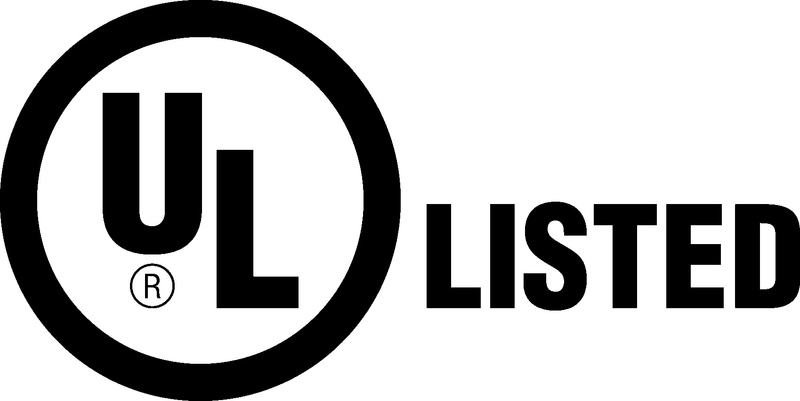 I have another list that also grows longer every day. It is a list of people willing to take personal direct action to stop this insanity. And right now, Mr. Peevey, I can tell you that it requires all the self-restraint I can muster to not chain myself to your chair in protest of this madness. The ‘smart’ meter rollout has been a half-baked debacle that is hurting California families, draining their bank accounts, and violating their privacy. 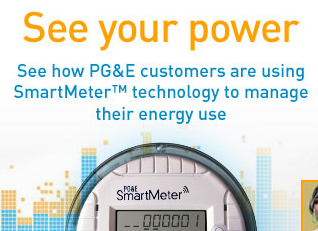 The CPUC’s handling of the ‘smart’ meter program has been– at best– schizophrenic. You knew back in the 1990’s that EMF’s are harmful- you even issued inserts in electric bills advising people how to reduce their exposure. Yet you authorized a wireless program that has inflicted powerful radiation and incalculable harm to California. To make a mistake is understandable- it happens even with $2.2 billion projects. To deny that harm is taking place. To continue to inflict that harm, despite all the evidence. To refuse to hold public hearings in the face of nearly 30 cities and counties lining up against the program. Video of yesterday’s testimony, and questions raised at the press conference following the meeting will be posted shortly. 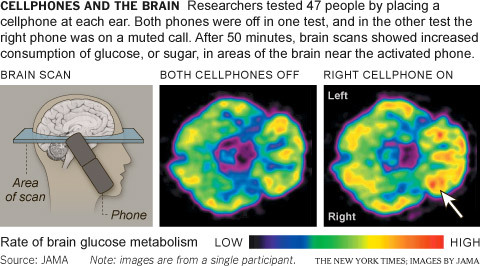 While government regulatory agencies continue to insist that non-thermal health impacts from wireless radiation cannot be proven, we now have what amounts to a smoking gun- that the function of the human brain is significantly altered by exposure to relatively low levels of EMF. Carried out by the National Institutes of Health, published in the Journal of the American Medical Association and covered by the New York Times among other media outlets, it seems that the official nature of this study is turning a lot of heads- and hopefully keeping them away from wireless devices. With new analyses showing whole body exposure to microwave radiation being actually higher from a ‘smart’ meter than that of a cell phone, this should ring loud alarm bells in every place where wireless meters are going in. President Obama visited the Bay Area last night for a meeting with leaders of the nation’s top tech firms at the Woodside home of John Doerr, a venture capitalist with links to Silver Spring Networks, one of the companies behind the ‘smart’ meter. The president got a taste of the widening protests against his ill-fated smart grid plans when his motorcade came upon protesters demanding a halt to forced wireless meter installation. While the promise of the ‘smart grid’ gained many supporters in the business and environmental arenas as a concept, it has become clear as smart meters have been installed that the meters do not deliver the energy savings promised- even generating additional carbon emissions. The benefits appear to be flowing almost exclusively to wealthy corporations while ratepayers and residents pick up the tab for the whole debacle, with many faced with skyrocketing bills and health impacts from the powerful wireless pulses. Kudos to the intrepid protesters who tracked down the president on a dar and rainy night to deliver their important message. 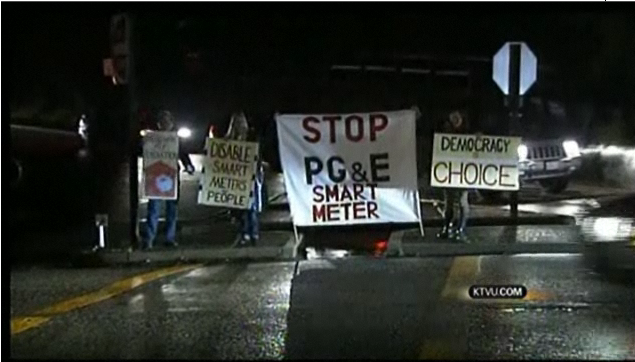 Video coverage of Obama’s visit and the anti-smart meter protests is available on KTVU Channel 2’s site. Thanks to EON for their video coverage of yesterday’s protest in San Francisco. 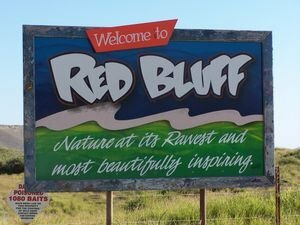 Reports are coming in from Red Bluff in Northern California that PG&E’s ‘smart’ meter installers have been threatening 78 year old ladies with having their power cut off unless they accept a new wireless meter on their home. In the middle of winter, threatening to cut off the heat to an elderly person’s home is akin to a death threat. If PG&E wants to pick a fight with the people of California, they’re sure going about it the right way. When I told (the ‘smart’ meter installer) my objections and that I was writing a letter to the editor of our local newspaper to vent my frustrations his expression suddenly changed and he looked very concerned. He told me to be careful about causing any problems for PG&E. He confessed that he had already been threatened by people and refused entry on properties. I told him that I could not help the actions of others but I felt it was wrong for PG&E to force the people to accept the SmartMeter without a choice and I felt compelled to continue my protest. He warned me that PG&E would retaliate by removing the old meter and leave me without any power whatsoever. I am 78 years of age, and I took that warning as a threat. What else could it be? That warning told me just what sort of authority I was going to have to face. But even more to the point, since when does big business dictate to the citizens of California they must accept a product or survive without electricity? That is totally against our constitution of civil rights, and I do not remember voting for SmartMeters. Capitola- During a meeting last week in which they joined six other local governments* who have passed laws criminalizing the installation of wireless ‘smart’ meters, the Capitola City Council discovered that the wireless ‘smart’ meters that CA utilities are trying to install are in fact not certified by Underwriters Laboratory, a certification that is required under the state electrical code for all electrical appliances and equipment within the home. – Landis* There were a few matches, but nothing looks like a direct match. – Silver spring* No matches came back. In summary, I am unable to confirm these devices as being UL certified. The revelation came after Councilmember Termini, who is an electrician by trade, asked PG&E about the certification. After PG&E staff went to their car to fetch a ‘smart’ meter, the council and PG&E spent several minutes unsuccessfully trying to locate the UL symbol on the meter. This convinced Councilmember Termini that an immediate ordinance was required to protect public safety. A number of fires that started in the new wireless meters have been reported, and last month a whistleblower from Wellington Energy- PG&E’s installation contractor- alleged serious breaches in safety procedures by installers, who are temp workers- not trained professionals as required by the Federal Communications Commission. Reports of fires, shorts, and electrocutions are also being reported in other countries where ‘smart’ meters are being installed, such as Australia. “Gov. 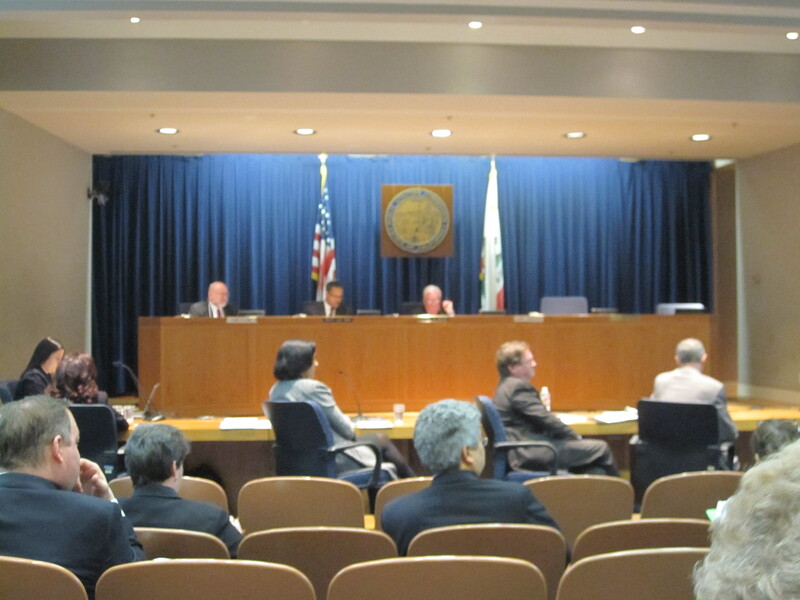 Brown must immediately act to remove President of the CPUC Michael Peevey, a former executive with Southern California Edison, who has been a symbol of the agency’s coziness with utility companies, a coziness that contributed to the San Bruno disaster as well as the current ‘smart’ meter debacle. The CPUC simply isn’t doing its job and it needs a change of leadership.” said Joshua Hart, Director of Stop Smart Meters! A Protest is planned tomorrow- Wednesday Feb. 16th Noon-1:30pm at the CA Public Utilities Commission, corner of McAllister and Van Ness in San Francisco. Representatives from grassroots organizations fighting the smart meter onslaught will be available for interview. Visuals include protesters with signs. *Counties of Santa Cruz, Marin, Mendocino, and Cities of Watsonville, Fairfax, and Rio Dell have criminalized smart meter installations. A total of 26 local governments in California have demanded an immediate moratorium. Recognition to the City of Capitola, who yesterday became the 7th local government in California to criminalize the installation of ‘smart’ meters in their jurisdiction. (along with Marin, Santa Cruz, and Mendocino Counties, and the cities of Fairfax, Watsonville, and Rio Dell). At least twenty-six cities and counties have demanded an immediate moratorium. On Tuesday we sat down to lunch with Greg Kiraly, new head of PG&E’s smart meter program, and several other PG&E and energy industry officials at a downtown SF luncheon sponsored by the Power Association of Northern California (or PANC). In November, Kiraly took over PG&E’s smart meter program from Bill Devereaux– or “Ralph the activist” as he preferred to be known when he was spying on anti-smart meter groups. (A criminal investigation by the CPUC is ongoing). Kiraly suddenly got very pale when I sat down at his table. He avoided eye contact and left the lunch early- perhaps all this public resistance to smart meters is getting to him. We spoke at length to the PG&E and industry people who were at our table, describing the hundreds of anguished complaints we’ve received from people with headaches, tinnitus, or difficulty sleeping since the meter went in. We told them about the people we knew who were so electrosensitive to the meters they had to flee their homes and their careers. We talked about the strong scientific evidence for health damage caused by wireless radiation, and the growing public resistance to their meters. We told them it must stop. And we also told them that we know they are good people with families that they love and care about and we know they wouldn’t want to willingly inflict this kind of pain on people. It was a rare honest exchange. These opportunities to directly communicate with a corporation like PG&E in an informal setting- out of the media and political sphere- are increasingly rare. They asked what we propose in place of the wireless meters. They asked where the funding would come from. We suggested fibre optic cable as an alternative to wireless and their investors’ 12% annual return as an appropriate funding source. They listened intently as I described the health damage that was occurring. 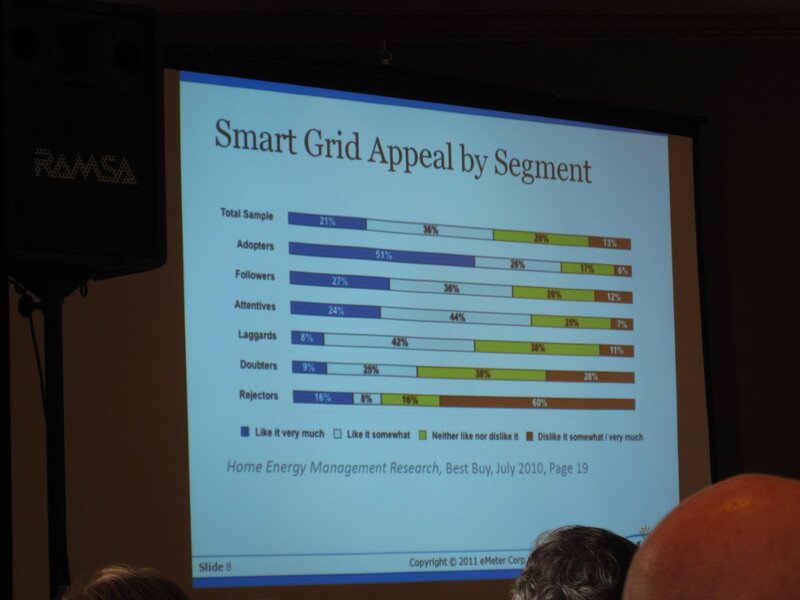 The smart grid companies like you if you are "attentive," of if you are an "adopter" or a "follower." They're not so keen on the "laggards", "doubters," or "rejectors" One man in the front snidely remarked: "those are the people that show up at PUC meetings......."
Indeed utility customers do feel a lot like rats, Mr. King. We both apparently have no choice in being doused with strong wireless radiation by governments and corporations. The peer-reviewed research says that rats’ DNA strands deteriorate when exposed to relatively weak rf signals- far below that of a smart meter. 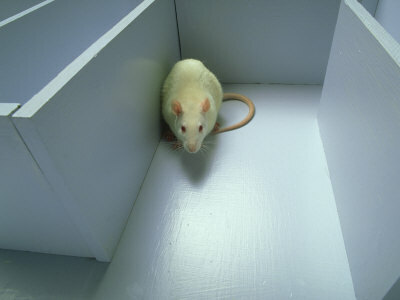 I’m sure the rats did not enjoy that experiment. We’re not enjoying it either. A MAJOR PROTEST AGAINST FORCED SMART METER INSTALLATIONS IS PLANNED THIS COMING WEDNESDAY FEB. 16TH NOON AT THE CPUC CORNER OF MCALLISTER AND VAN NESS IN SF. BE THERE. WEAR RED.